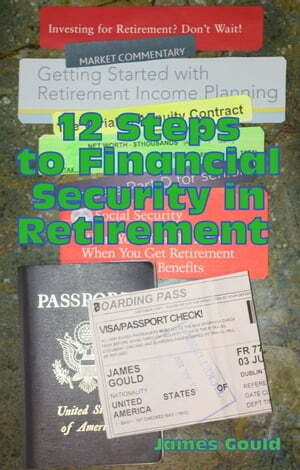 Collins Booksellers - 12 Steps to Financial Security in Retirement by James Gould, 9781301054589. Buy this book online. As we approach retirement, most of us ask the question will I run out of money before I die? How do I figure out my “Number,” the amount of money I will need? How should my money be invested to make it last? Should annuities be part of my investment mix? How do I minimize taxes to leave more for me? What strategy should I use to draw down my savings? What is the Monte Carlo analysis that is used to calculate the odds of running out of money? What about “spending the house” by downsizing, selling or a reverse mortgage? Is it better to start Social Security at 66 or wait until 70? What will Medicare and Medigap insurance cover and what will it cost? To help in your planning, there are worksheets to calculate your expenses and income in retirement. There is a work sheet for Net Worth in a format I devised to see at a glance asset allocation, tax impact and order of asset drawdown. The Table of Contents is interactive; you can go right to any topic by clicking on it or touching it. Checklists point to the relevant Steps depending on how many years you are away from retirement. There is a glossary of financial terms at the back, also with references to the Steps. In short, this book has everything you need to answer your financial questions both planning for and during retirement, one Step at a time.